In time of war, the development of cease-fire plans that have served as a basis for proposed understandings. 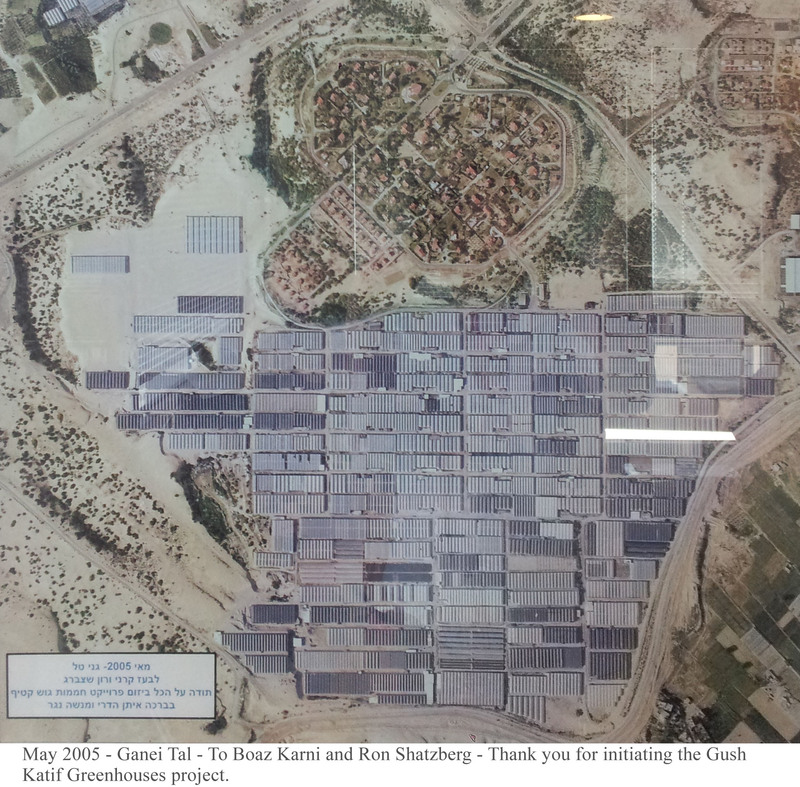 Prior to Israel’s disengagement from Gaza, ECF initiated and brokered the deal that led to the successful transfer of the settlers’ greenhouses in Gush Katif to Palestinians farmers (see picture of Gush Katif greenhouses dedicated to ECF by representatives of the Jewish settlement of Ganei Tal in Gaza as a thank you for having initiated the "Gush Katif greenhouses" project). Even though the Gaza border crossings were subsequently closed, this project did help to save 3,000 places of employment for Palestinian farm workers, as Special Envoy for Disengagement James D. Wolfensohn reported in his October 17, 2005 Periodic Report. Access and movement – ECF has prioritized steps to remove roadblocks and checkpoints in the West Bank with the most detrimental impact on Palestinian daily life and economic development. By using its unique access to Israeli security authorities and to the main international players, ECF has successfully assisted in easing movement and access in the West Bank and in this way has contributed to Palestinian economic development. Enhancing Palestinian security capacity in the West Bank - With the aim of enhancing both Israeli security and the Palestinian capacity to govern, ECF has outlined practical measures to allow for further deployment of Palestinian security in the West Bank. 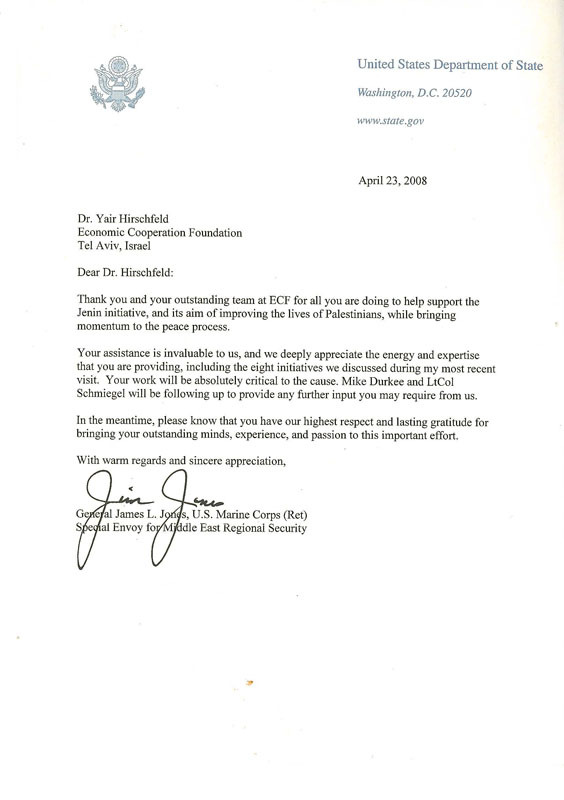 ECF's recommendations have been shared with relevant US interlocutors and senior Israeli security officers, which have largely supported the suggested path (General James L. Jones's thank you letter). Moving the security barrier – ECF has worked in coordination with the Israeli Council for Peace and Security to alter the route of the fence so that it meets Israel's security needs, ensures the least possible damage to the Palestinian population and safeguards the prospects of the two-state solution. This work has led to numerous Israeli Supreme Court decisions in favor of the suggested route. ECF also prides itself on its recently developed channels and dialogue with important regional players including the Muslim Brothers and Saudi Arabia, who so far refuse to communicate with the Government of Israel.